Who says bridal shoots have to be a cliché? We don’t, and Photographire sure doesn’t! 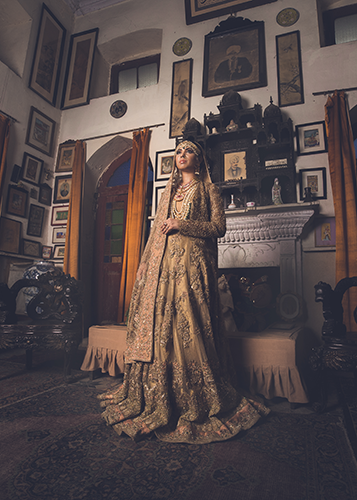 We don’t know about you, but we sure are done with the bridal shoots where brides are propped up against antique looking wooden doors or inside dolis for perhaps the most important photoshoot of their lives. Guaranteed, that too, has its charm, but clichés become clichés for a reason. So this shaadi season, we are BEGGING for more, for better, for out of the box. Luckily, Photographire shares our sentiment. In a five piece look book (a photography trend that wowed us by the way), Photographire features five different types of brides, set against their own unique settings befitting their title. Adorned in gorgeous Farah and Fatima dresses, both from their newest collection as well as their classics, made over by Nadia Ahmed and laden with beautiful Zaheen Kamran jewels, we feel that these five bridal shoots will surely start a new trend. See for yourself, if you don’t believe us. We can’t express how much we loved this one. From her simple makeup and her heavy dress, this bride is a refreshing reminder of our roots. It reminds us so much of our mothers and grandmothers wearing heavy jewellery and a dress so simple yet beautiful that they didn’t need a ton of makeup to bring out their beauty. To top all that, this shoot is set in one of the cultural hubs of Pakistan, the Fakir Khaana Museum, which just adds to its beauty and simplicity.